After seeing so many wallpapers of Saya all out with her katana and all kickass, I thought that I wanted to show the gentle side of her. So, after using several screenshots of the new ED, I put together an image I thought could be worked with! Wow, that is a very busy background. She certainly does look trapped...imprisoned even. That's both good and bad. It's good because, well, it has meaning and it's really cool. It's bad because there's really nothing to distinguish her from the background. She is the background. It's...I don't know....kinda weird and distracting. It does look awesome, though. I like the softer "weathered paper" color choice. It looks great. At last! Ilove the series and all the wallpapers I saw were at best uninteresting. Then I stumbled on this jewel you crafted. This wallpaper is a wonder. The problem with anime wallpapers is that people forget elegance, you did not. Of course a fav from me, sweetie ^_^ Good luck on your next work! The brushing is so pretty! Really well done on it, I especially like the stained glass effect you spoke of - it really worked. A well-done screencap wall...never thought I'd see one :) Love the brushing; it really goes with the style of the ED; gives it that beautiful sunbathed, old photo, garden look. Hm...you may want to vector screencaps for walling in future though. It's so well-composed! 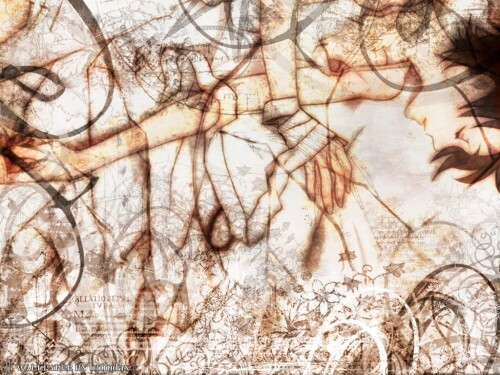 This wallie looks very ancient~ just like those ancient maps~~~ So cool! wonderfull work, I love this effects and texture and details, this wallie is great! i love the bright color and the abstracts! Very beautiful! I love how even though she's trapped, she looks so frighteningly calm. It reflects her lack of care near the end of the series. Nice job! Congratulations! It's beautiful and special! This is fabulous ...xD !